Harry Snyder died peacefully yesterday after being sick for a while. He was one of my all time favorite people. I met Harry after I met his daughter, Sandy. My first day in the dorm at college, Sandy came down the hall, knocking on every door. "Youse guys gonna party or what" she asked each of us. Had a hat out, collected money, and made arrangements to get to the liquor store. I told her I did not drink, but would be happy to drive while everyone else was. And when we got to the parking lot, it turned out she had a brand new Pontiac Firebird, rear spoiler and all. Quite different than the station wagons and VW's my family had owned! Sandy was Harry's only child, and he loved his daughter fiercely. 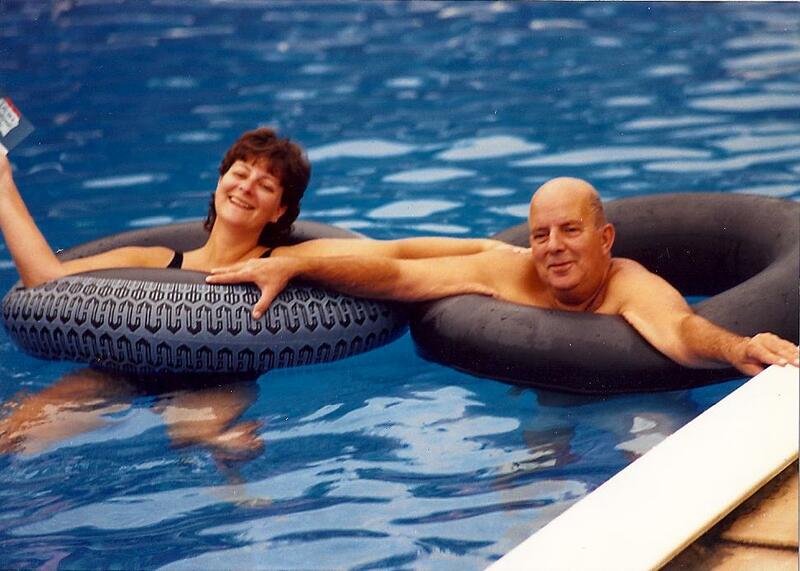 The pool that was in the back yard of his home in Pasadena, MD had been built by the 2 of them. She told me about wrestling the giant concrete squares that wrap around the pool..the 2 of them moved each one into place. They installed the pool liner after digging the hole. I did not grow up with people who were capable in this way, thought it was amazing! Harry had grown up in Cumberland, MD, had served in the Korean War..at some point in time had met Wilma, her mother, and they had moved to Pasadena. He worked for Bethlehem Steel in Baltimore, the Key Highway location. He was a crane operator, worked the night shift and eventually retired from there. He was so proud of his daughter going to college. Eventually Sandy and I roomed together in the dorm, got an apartment together..and after the first month heat bill, found many more roommates so we could actually run the heat and afford it..probably violated a few laws of occupancy there..and all along Harry was there, helping in every sort of way. I met my first husband, visited Harry, my daughter has been to see him, he attended parties, we would always keep in touch. When I was still a teenager he started to talk to me about finances. He always advised to not carry a mortgage, to not purchase a car unless with cash, to work hard, invest as much of my income as possible. He followed the stocks, and purchased stocks for his daughter, resulting in dividend checks in usually small amounts, enough that we could eat for a couple of days..always welcome! When I was in my junior year of college, he asked me about my class ring. He wanted to know where it was! When I told him I needed new tires for my vehicle, he took out his wallet, asked me how much the ring cost, and took out the needed cash, handed it to me. Told me to go get that ring, and call him the next day when I had completed the order. I still have that ring, I wear it every so often, it is a beautiful and lasting memory of his kind, generous and fun nature. The last time I saw him was last year. His health was clearly failing, and was in the hospital. But he immediately asked me about Homer, Claire, the farm, the farm business, told me about his relative that ran a chicken farm, asked about the breed of beef, birds, everything! He was as sharp as ever. I thanked him for his guidance, his persistence on insisting that I buy and pay off property early. I told him that while it might have seemed like I was not listening or understanding, I was. And today Homer and I live on this little place mortgage free, with no car payments, no tractor payments, no HELOC..no cash either, but no debt!! We would never have been able to live here, to allow Homer to farm in this way that he loves so much, if it had not been for Harry putting a bug in my ear when I was back in college. Every time I spoke with him he enlightened me about something..his knowledge was wide, his experteise was quite varied. As Homer and I explore the concept of adding solar panels to our property, I realize Harry is a guy I would have asked about how to do this ourselves, even how to build them ourselves. And he would have known, he was that kind of guy. I'll miss him and his optimistic, upbeat and loving ways. He used to say, when he was floating around in his pool, enjoying a lazy, hot, summer afternoon: "I wonder what the poor people are doing". It used to make us laugh, partly because he knew exactly what they were doing, having grown up a poor kid in a small community. He sure lived large and well, and was happy to share his knowledge. Rest in peace.